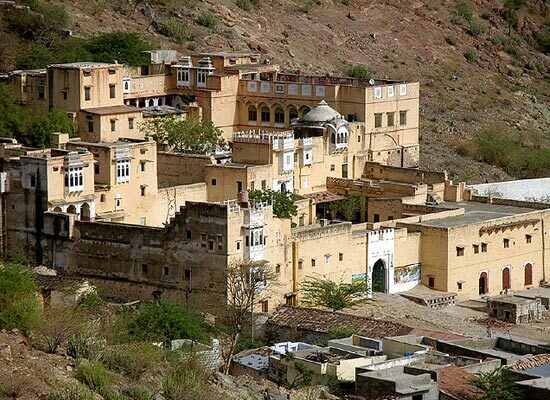 "Bhadrajun Fort, Jalore, Rajasthan has been the majestic family home of Rathore kings of Marwar. The incumbent, Raja Gopal Singh ji owns the magnificent fort which has now been converted into one of the finest heritage hotels in India. Overlooking the beautiful village of Bhadrajun, the fort overlooks the charming desert scenery. Bhadrajun Fort combines modern facilities with ageless luxury and the splendor of the bygone era of Bhadrajun. The wealth of classical 16th century Marwari architecture, the abundance of priceless art, and the desert hospitality, creates a cherished experience. 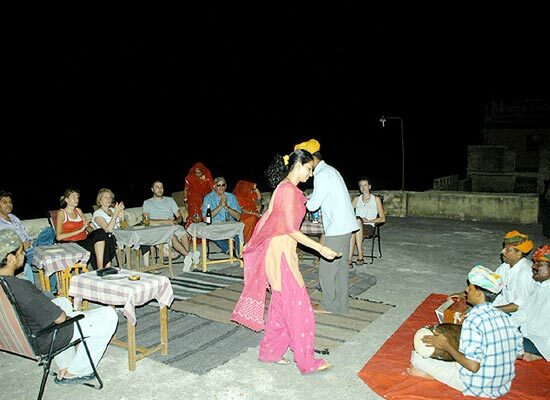 Enjoy the taste of the princely times of Rajasthan without missing of luxuries of today. Bhadrajun has an interesting history. Legends narrates an incident of Mahabharata. One of the prince of Kuru Dynasty, 3rd Son of Pandu, Arjun eloped with Lord Krishna’s sister, Subhadra and married her. They escaped to the desert village and settled here. Inspired from them, the area got named Subhadra-Arjun which with time became Bhadrajun. The Bhadrajun Fort is an architectural masterpiece created by the Kings of the Rathore Clan of Marwar. The fort was built by Thakur Ratan Singh the 4th son of Maharaja of Jodhpur Rao Maldeo in the year 1549. Currently the ancestral home is occupied by the 17th generation of the founders. Today, Bhadrajun Fort remains the family home, and also a luxurious heritage resort. 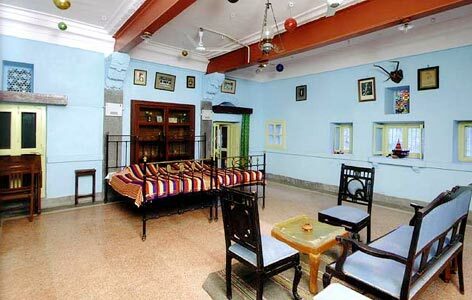 Bhadrajun Fort offers you a wide variety of accommodation ranging from Standard to Deluxe Rooms. All 15 of the lavish rooms are set around peaceful courtyards. Adorned in a traditional Rajasthani setting of glass work and gold paintings, rooms are a relic of history and every modern amenity for guests to enjoy an opulent stay. 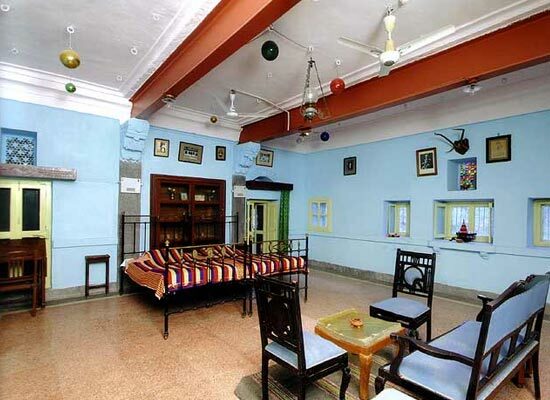 Heritage Rooms of Bhadrajun Fort are decorated in traditional colors and feel. Attached bathroom, running hot & cold shower, comfortable beds and a range of facilities gives the feel of royalty. Kanch Mahal of Bhadrajun Fort is a beautiful room decorated with pleasant wall painting and traditional glass work on walls. It has a traditional king size bed with luxurious features and fixtures. En-suite bathroom with running hot and cold water, dressing room, lavish facilities are provided. It is a cherished experience to stay in this room. 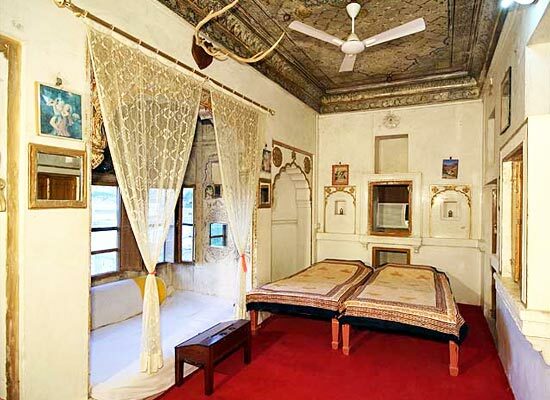 The Sunehari Mahal is the liveliest, spacious, and tastefully designed room at Bhadrajun Fort. It offers complete privacy and a spectacular view of the hills, which can be enjoyed from balconies or large bay windows. It is especially crafted with gold painting on ceiling. Facilities include attached bathroom with hot and cold water and other lavish amenities. Revel in the best experience of history and modern luxuries. The in-house restaurant at Bhadrajun Fort attempts to recreate the old-world regal charm of Rajasthan. Relish interesting signature Rajasthani dishes. Dine under the stars lost in the tantalizing flavors of the exquisite Indian flavors and traditional ceremonies. Folk performances and cultural extravaganza can be enjoyed while you dine. Bhadrajun is a village in the Jalore district of the western part of Rajasthan, India. Dating back to ancient times of the Mahabharata epic, it has a popular legend associated with it. However, in recent centuries, it was the site of war between the rulers of the Marwar dynasty and of the Mughal Empire. The Bhadrajun Fort presides the traditional desert village of Bhadrajun. Enjoy the history, heritage and the natural beauty. 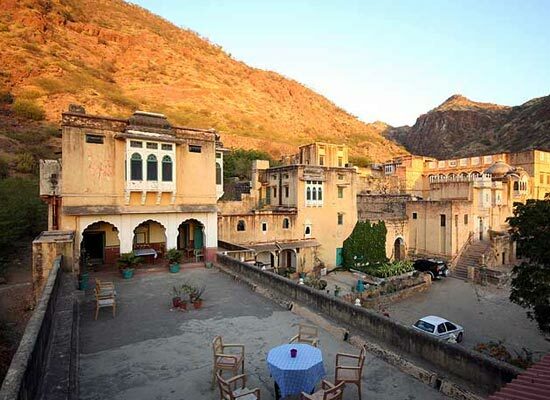 The rustic charm of Rajasthan tempts you for stay and Bhadrajun fort makes it memorable.